Clothing/Jewelry Description A striped shirt or a white muscle shirt with writing on it, wind pants or blue shorts, and sneakers. Medical Conditions Woodworth suffers from back problems. Distinguishing Characteristics Caucasian male. Brown hair, brown eyes. Woodworth has tattoos on both arms, including a cross and the word "mom" on his right arm, and he has a burn scar on his left arm. He had a mustache at the time of his disappearance. 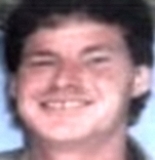 Woodworth was last seen walking in the 200 block of north Elm Street in Charleston, Missouri at 4:30 p.m. on October 11, 2007. He was allegedly going to speak to one of his sister's neighbors, who owed him money. He has never been heard from again. He had numerous problems with the law prior to his disappearance, had served several prison terms, and may have been involved with drugs. Just before his disappearance, he had been released from house arrest. Authorities believe Woodworth may have gotten into a white Oldsmobile on the day of his disappearance. Witnesses reported hearing the sound of a gunshot in the area, but this hasn't been confirmed. Woodworth's loved ones stated it is uncharacteristic of him to leave without warning, as he was close to them. He did not own a cellular phone or any credit cards at the time of his disappearance, and he did not take any personal belongings, money or identification with him. Foul play is possible in his case, which remains unsolved. Updated 7 times since October 12, 2004. Last updated February 2, 2019; distinguishing characteristics updated.